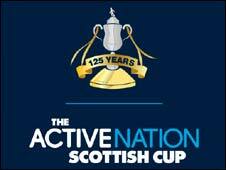 St Mirren will host either holders Rangers or Hamilton Accies in the Active Nation Scottish Cup fifth round. Two other all-SPL ties are possible with Kilmarnock or Falkirk meeting Inverness or Motherwell, while Dundee United visit St Johnstone or Forfar. If Dunfermline remain in the cup after fielding a suspended player they will play Morton or Celtic at home. Hibernian could host amateur opposition if Edinburgh City can knock-out Third-Division side Montrose. After dumping SPL rivals Hearts, Aberdeen have a trip to lower-league opposition in the shape of Raith Rovers or Airdrie United. At least one Scottish Football League side is guaranteed a place in the quarter-finals, with Livingston or Dundee hosting Ayr United or Brechin City. And if Highland League club Inverurie Locos can overcome Ross County of the First Division, they would meet Albion Rovers or Stirling Albion. The nine outstanding fourth-round ties postponed because of the freezing conditions are scheduled to take place over the coming fortnight.